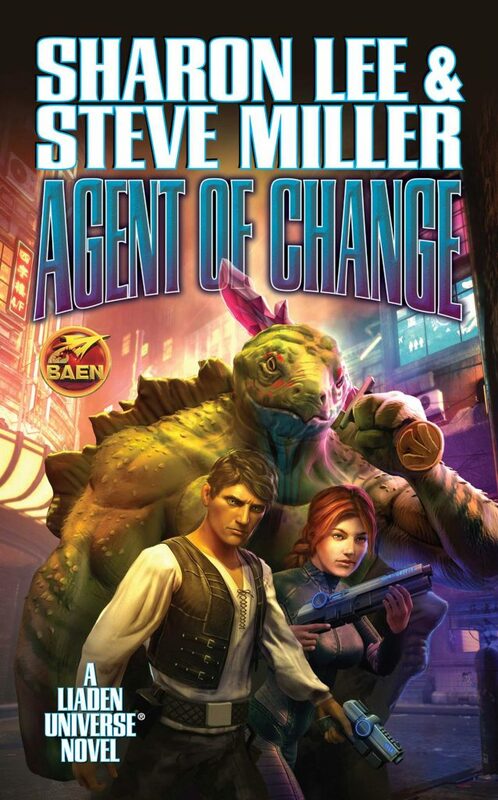 This is the cover art for the Thirtieth Anniversary Edition* of Agent of Change, by Sharon Lee and Steve Miller. Art by Sam Kennedy. *This is a mass market paperback. The publisher has no plans at this time to publish a hardcover. Wow, Edger looks really buff and that’s one heck of a knife! Cool. I think I like Miri’s hair style better in Michael Herring’s version, but the long braid will likely sell better these days. So that what Edger looks like! I understand Baen’s motivation, but I still think there should be a hardcover edition to celebrate AoC’s 30th anniversary. Do you know how many preorders you’d need to get Baen’s interest? I ran across Liaden Universe by a complete non-accident. I can’t stop reading this stuff! THIS IS THE MOST ADDICTIVE STORY I HAVE EVER SEEN!!!! I started reading about a month ago. I swallowed seven books already and I can’t quit. Way too many things for an old street rat like me to relate to. Long live the Tree and Dragon !!!!!! Hello! I recently rediscovered the Liaden books and have been trying to get them all. I see there is a revised and expanded edition of Fledgling and was wondering if this 30th anniversary Agent of Change will have any additional content as well? Are there currently any plans to re-release/revise/expand any of the other, older titles? Revised and expanded Fledgling? Hmmm … I see. The original online publication week by week was never meant to be the final version — it was in fact, an online rough draft. The first paper version and the ebook version would have caught a couple typos and maybe added an author’s note. Agent of Change will have a new author’s note and we have, in fact, gone through the book looking for tyops and mangled sentences since the book had seen a number of publishers and wasn’t always treated well by copy editors. Changes, if any, for the 30th were for clarity and accuracy, usually with reference to the first edition at the preferred text. We do hope to see other single editions of several of the books which have mostly been seen in omnibus, but again, without heavy editing or rewriting. That’s exactly what Val Con looks like in my head, but shouldn’t his hair be longer?